I want to thank everyone who took the time to leave a comment. It was so much fun connecting with you all! It felt like I hosted this great party but without having to clean up afterward! Hope you all enjoy your patterns. There were 2 people who commented that I didn't get any contact information for: sutomwill and Annie so if you read this, email me so I can get your patterns to you. One of the things I miss about having a yarn shop is teaching knitting. So with all the inquiries I've received about the 2 in 1 socks I thought the best way I could teach it without a shop would be to have a knit along. Starting next Monday maybe sooner I'll post detailed instructions with photos and maybe even a video on how to knit a simple sock one inside the other. I'm hoping some of you are ready to start as I would love to get finished sock photos to post when we are through. I think it would also be helpful if people used the comment section with any questions they might have as this might help someone else too. Onto knitting 2 socks in 1 with a little prep work before my next post. To start you'll need enough yarn for a pair of socks wound evenly into 2 balls. 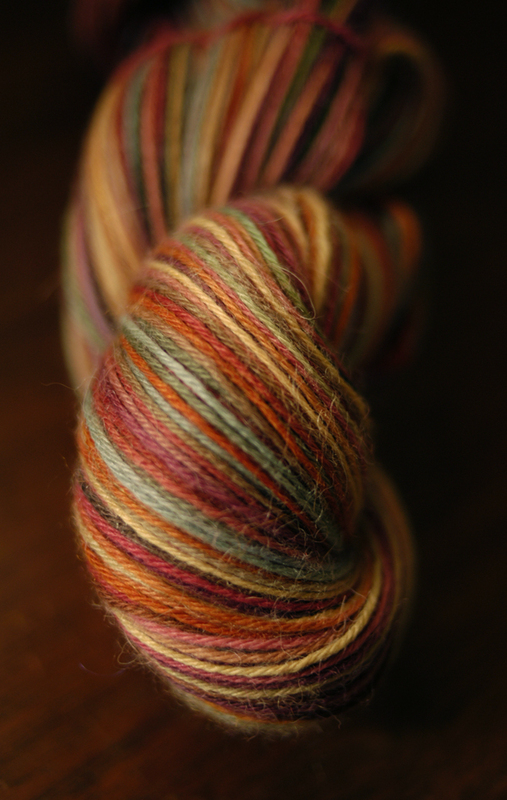 In my original post I used the Misti Sock yarn pictured. It's best to use a sock yarn that is multicolor because it will be easier to see the difference of the stitches ie inner & outer sock. If you're just experimenting you could use 2 different color yarns or even thicker yarn although the numbers I'll use are for sock yarn. I used a #1 for the last pair I did and was happy with my gauge. I'm going to make another pair of children's socks and will use the numbers for that throughout the post with side notes for larger sizes. From basic sock patterns I've seen it looks like they subtract 4 stitches as you go up in needle size. So if you cast on 64 using a size 1, cast on 60 using a size 1.5 and 56 using a size 2. For the children's socks I cast on 50 but since I'm making these for my older daughter I'm going to cast on 56. What ever number you choose make it divisible by 2. This will help when turning the heel. So our final preparation before my next post is to cast on the number of stitches you've selected onto 2 separate double pointed needles. For me I'll have 2 needles each one with 56 stitches. I used an Estonian cast on for the last pair and really want to share this with you as it has nice elasticity for the cuff but since my photographers asleep I'll add that to the post tomorrow I think video is in order for that one. Thanks again for helping me celebrate and for your kind comments! Also for your interest in the 2 in 1 socks. I'm looking forward to this KAL and hope that at least a couple of you are too! Good to hear from you! I'm using 5" sock needles. So if you have at least this size. You could also use 2 circulars. It will work with either. I"M SO EXCITED! I can't wait to start!! !